WRML.Breed for resistance and/or resilience ? Also: fasciolosis in humans; FWEC course in Tamworth (and elsewhere); Jet lag – there’s an app for that; Phubbing; Easter Road Safety; Moron multitasking. The following, a media release from the Sheep CRC, addresses the question. Sheep breeders pursuing worm ‘resilience’ rather than ‘resistance’ could be placing undue pressure on their sheep during the current dry seasonal conditions. According to Executive Officer of the WormBoss program, Dr Lewis Kahn, sheep breeders selecting better grown sheep are indirectly selecting for worm ‘resilience’ but this does not improve worm ‘resistance’ because they are separate traits. “Resilience is difficult to measure because it is the difference in production between worm-free and when infected, and represents the cost of worm infection. Dr Kahn said worm resistance was considerably more heritable and could be improved by using Australian Sheep Breeding Values (ASBVs) for faecal worm egg count (WEC). “Where producers are selecting sheep for production under normal levels of worm challenge, research has demonstrated that this will also select towards worm resilience,” he said. “In contrast, worm resistance doesn’t come from selecting for production and needs to be separately considered. “While ‘resilient’ sheep may be little affected by their own worm population, the worm eggs they deposit in faeces onto pasture provide contamination attacking the susceptible sheep. The WormBoss program was developed in 2005 by the Cooperative Research Centre for Sheep Industry Innovation (Sheep CRC) and Australian Wool Innovation (AWI). Since then the WormBoss website, www.wormboss.com.au, and the WormBoss training workshops have been delivered to producers and industry advisers to help industry to reduce the cost of worms through tactics including grazing management, breeding for worm resistance, managing for production targets, using effective drenches and managing drench resistance. “Commercial sheep producers can identify candidate sires for purchase based firstly on the productive traits they need and then from within this group purchase those with the most negative WEC ASBV. This ensures both productive and worm resistant sires and excludes those sheep where resistance comes at the expense of production,” Dr Kahn said. It’s an approach supported by the President of the Australian Association of Stud Merino Breeders, Phil Toland, who said that while more research was needed into how sheep and worms interact, the current evidence was clear that the best insurance for a sheep flock against worms was to breed for resistance. “I hear breeders saying they have sheep with high egg counts that are their best doers in their flock and are therefore resilient to worms, but there could be other reasons why that sheep is a good doer,” Mr Toland said. “For me the bottom line is that resilient sheep might cope pretty well with worms, but they are still breeding worms which will affect the weaker sheep in the flock, whereas resistant sheep won’t support worm populations. Mr Toland runs Toland Merinos, at Violet Town, Victoria, an 800-hectare property with an average annual rainfall of 625mm. The local environment is suited to the parasitic worms Teladorsagia (small brown stomach worm) and Trichostrongylus (black scour worm). Mr Toland has been taking worm egg counts on his 4500-head flock, which includes 1200 stud ewes, for more than 10 years, while at the same time selecting heavily for worm resistance as part of the breeding program. Mr Toland said that his worm populations have declined dramatically and his reliance on drenches has been greatly reduced delivering significant savings in terms of dollars, time and labour. “At the end of the day I want sheep that are both resistant and resilient – that is, I want sheep that don’t carry worms but can also cope with life’s stresses and strains and remain productive,” he said. · For more information on breeding sheep for worm resistance visit www.wormboss.com.au. The media release above (used here with permission) was prepared by Michael Thompson for the Sheep CRC and edited by Assoc. Professor Dr Lewis Kahn (Executive Officer of ParaBoss) with input also from Dr Brown Besier. The article, large parts of it at least, appeared as part of a bigger piece by livestock editor Jaimie-Lee Oldfield in The Land newspaper on 10 April 2014. Bear in mind this is a newspaper article, not an exhaustively accurate scientific treatise on the subject. Still, it is of value for persons like myself who have short attention spans, and for others. ‘Quite interesting really, and not too long. An excerpt: “People can protect themselves by not eating raw watercress and other water plants, especially from endemic grazing areas. “. I know of at least one human case of fasciolosis in the New England region associated with consumption of watercress harvested from a creek on farm. Some have suggested that ‘wild-harvested’ watercress can be rendered safe (from parasites for example) by rinsing then soaking in dilute hydrogen peroxide (http://foodfacts.mercola.com/watercress.html). This, in fact probably just thorough rinsing, may work for nematode larvae, but I have my doubts regarding the infective stages (metacercariae) of Fasciola as they encyst onto herbage. Related: https://wormmailinthecloud.wordpress.com/2011/02/01/wormmail-20110201-trichostrongylosis-in-humans-redux/ (Yet another reason that real man eschew salad). For even better information or to register call Cassie Gardiner 6763 1276 or Julie Chapman 6763 1285 or email [tamworth.profarm@dpi.nsw.gov.au]. It’s April, so if I don’t say something about liver fluke (Fasciola hepatica) (which I would anyway, of course), I will be getting emails from ‘Professor Fluke’ (Dr J C Boray). April or May (whenever the cold weather sets in) is the time for the most important strategic liver fluke drench in south eastern Australia. All this assumes that you know whether you have fluke and even perhaps which paddocks are ‘flukey’ and which aren’t. April-May marks the end of a few months build-up of fluke (on pasture and in animals) and their host snails (assuming a good season), and the beginning of colder weather where fluke may be unable to complete its life cycle (just like Haemonchus – barber’s pole worm), although the infective stages (metacercariae) may survive in declining numbers through to spring (just like Haemonchus infective larvae). It’s important to bring out the big guns – the most effective flukicides- for the April drench. For sheep and goats and alpaca, this means triclabendazole-based drenches. In cattle there is also the added option of Nitromec(R) (clorsulon+nitroxynil (both flukicides), + ivermectin). Another reason to drench now for fluke is that it may be needed as a tactical treatment as well: i.e. you may have stock dying, sick or subclinically affected with fluke disease. ‘Liver fluke infections in both sheep and cattle are more prevalent in the New England region this summer. Stock have been forced to graze in the normally wet areas of paddocks, ingesting liver fluke in the process. Treatment for this parasite is advised over April/May (if not already given) on those properties with known positive fluke status. If uncertain or seeking confirmation, fluke egg counts on faeces or blood antibody analysis are the common laboratory tests utilised to establish liver fluke status of livestock’. * Seddon HR, revised by Albiston HE, 1967. Helminth Infestations, in ‘Disease of Domestic Animals in Australia’. Commonwealth of Australia, Department of Health. Also see map in the Primefact by JC Boray (Liver fluke disease…): http://www.dpi.nsw.gov.au/agriculture/livestock/sheep/health . Those who lamb in Spring (say September) will be joining (tupping in NZ, UK) about now. In many sheep areas of NSW, especially cooler areas (where larvae take longer to die), you need 5-6 months** to prepare lambing paddocks so they are relatively low worm risk. (** 2-6 months depending on time of year, and location/climate). As to (1), I am particularly thinking of the New England here and Haemonchus, our bogey worm, but not the only important worm. Haemonchusis a drama queen (it kills sheep; ‘not a quiet achiever like the scour worms), but it is also a delicate little princess when it comes to its eggs. Haemonchus eggs once deposited on pasture only live 7 days or so, and in that time need temperatures generally above 10 (deg. Celsius) at night and 18 during the day, and lots of moisture (roughly 10 mm rain (or equivalent) or more every several days). (This ‘epidemiological’ information on various worm species can be found in the Appendixes/Tables at the end of Your Program (for different regions in Australia) in WormBoss. I don’t need to remember this information anymore: I just need to know how to get to WormBoss ;-). All this information on paddock preparation by the way is spelled out in a highly readable and digestible (and printable) format in Your Program at WormBoss. May–August: no grazing restrictions apply when maximum daytime temperatures are consistently below 18°C, if they are not then use the same strategy as for March and April. Prepare low worm-risk paddocks for lambing and weaning by preventing contamination with worm larvae in the 2 to 5 months before they are needed. (Click here for the number of months required for your location). In this time, spell paddocks, graze with sheep only in the 0–21 days after an effective drench, or graze with cattle. Use ‘Smart grazing’ to prepare winter weaner paddocks. My apologies for the meeting in Perth – wish I could be there but ‘advancing years’ rather restrict by 91 years. I trust you have a successful gathering in Perth – I was last there for my 80th birthday which happened to be the opening day of the Conference – ??? fine?? party? That night ??. What changes we have seen – my earliest introduction to parasitology was in the bush on my father’s sheep and cattle property west of Armidale – he used to show me the Barbers Pole Worm in “ration” sheep, or the nodules (Oesophagostomum – a rare species now?) which he blamed on arsenical drenching. It was my job from age? 10 on to ? “Webbers”? arsenical? Drench. I learnt the zoological names of the worms from a booklet written by? H.A Veron Of Vita-Lick which was one of the few firms in those? days which marketed anthelmintics. Sagers? Allport was on the job too when carbo.tet. came on the scene. “Green ? Seal?” which I think was “a guinea a gallon”. It was (a) near miracle drench then – in? the? 1920’s it converted lots of “Rotten” country into useful sheep properties as it kept Fluke down to reasonable levels. One of the great gaps in research – we still don’t know why CCL4 was sometimes deadly for host as well as parasite. Best wishes to all at the muster in Perth and I trust you have a successful meeting. I decided to check on Mr Veron. MR. H. A. VERON’S VISIT. Stock owners will be pleased to hear that Mr. H. A- Veron, Technical Adviser to Vita-Lick Limited, is visiting Western Australia during September and October and will be giving a series of Lectures and demonstrations in various parts of the State. It will be remembered that Mr.Veron, who visited Western Australia last year, formulated a special mineral mixture for cattle suffering from Wasting Disease in the Denmark district. The results were so spectacular that the Agricultural Bank are now supplying all stock in the Denmark district with this lick. This year, Mr. Veron is particularly interested in the paralysis disease in the Eastern Wheatbelt. Analyses are being carried out of the pastures throughout these districts, and in all probability a special mineral supplement will be formulated with the object of preventing these losses in the Eastern Wheatbelt.
" (It is) interesting that a worm (liver fluke) prevented the use of grazing land – a bit like Haemonchus does for some tropical areas now. The wasting disease at Denmark, also called “Coast Disease”, is copper and cobalt deficiency – a product of the light sandy soils in many parts. To this day, thin, unthrifty cattle and sheep occur where supplements are not give to schedule. Great research by the University of Western Australia agricultural faculty and Ag Dept pathologists in the 1930s elucidated this. " Using the internet search engine of my choice, I could not find out what ‘toxic paralysis’ meant, and various newspaper articles in Trove, shed no light either. I then wandered down to a colleague’s office, and ferreted out his copy of Hungerford’s Diseases of Livestock (8th ed., 1975), wherein I found, on page 248, that toxic paralysis was, perhaps still is, another name for botulism. (So much for the internet). So, it may well be that the vaccine being trialed in Western Australia (mentioned here: http://trove.nla.gov.au/ndp/del/article/38942366 – Western Mail – Perth – 1935), was an anti-botulinum vaccine. Preventing pica (e.g. chewing bones) by way of nutritional supplementation of course is also a preventive measure (which perhaps is where Mr Veron and others came in). Here is a WA factsheet on botulism (https://www.agric.wa.gov.au/livestock-biosecurity/botulism-cattle), one of the authors being Brown Besier’s son. WRML. A New England (NSW) DrenchTest. 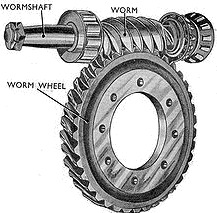 motility of worms. 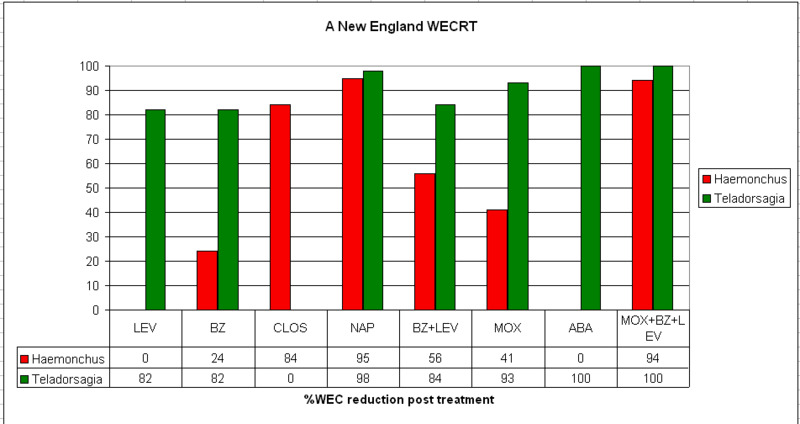 Below are the results of a faecal worm egg count reduction test (aka WECRT, FECRT, DrenchTest) done on a New England sheep and cattle property towards the end of last year. For those from afar, the New England region is essentially the northern tablelands of New South Wales – sitting atop and astride the Great Dividing Range – along with nearby slopes (to the west). Rainfall on average is more or less 800 mm per year (over 1000 mm in some places) and tends to be summer dominant. The altitude of the tablelands is around 1000 masl (up to 1400-1600 metres in some places). Winters are relatively cold, and summers are warm, not especially hot (the record high is ~ 37 deg. Celsius). Not surprisingly Haemonchus (and, in the olden days, Oesophagostomum columbianum(nodule worm)) does very well here, with the ‘icing on the cake’ being liver fluke in certain localities. Of course, quiet achievers like black scour worm (Trichostronglyus) are always lurking in the background as well. Our New England winters, compared to those in the New England in the US, are relatively mild: http://www.bom.gov.au/climate/averages/tables/cw_056238.shtml . The property on which the DrenchTest was done is not small: they run somewhat more than a few thousand DSEs (dry sheep equivalents) so, unwittingly using ineffective drenches would have had a big if not immediately obvious impact (on productivity, and the well-being of the sheep and the owners and station hands). So, back to the farm in question. Despite a near record dry spring, which turned into a record dry summer, this producer was ‘chasing worms’ all spring. It seems the producer’s perception of the need to drench was based on clinical signs (mucous membrane pallor, exercise intolerance in some sheep (i.e. ‘failed the ‘Honda test’), the occasional WormTest, and Haemonchusbeing seen on post-mortem examination of the occasional hogget that expired. Like many producers – and people in general? – the owner was too busy to stop and think. On farms, one reason for this perhaps is labour costs. Drench choice seemed to be guided by best bet advice from the drench reseller, which I think was based on the occasional DrenchCheck, and more or less educated guesses. A colleague asked me why this producer was having a problem, especially given the dry spring. I suggested a number of factors including poor grazing management, sub-optimal nutrition (it wasn’t a good season) and a high probability that ineffective drenches were being used unwittingly. So, lots of Haemonchus larvae being produced in autumn, compounded with less than optimal nutrition and grazing management, and a high probability that drenches were poorly timed and not working properly. When visiting the farm with a colleague in the spring, I decided to get just two points across. I said, ‘I wouldn’t bet my house on that drench working’ (they were in the middle of drenching hoggets with Cydectin Triple Active drench), and also told the owner the simple steps to take to prepare a paddock for weaning in summer. If someone tries to tell us all we need to know – and in great detail – in one sitting, we won’t take much of it in, much less apply it). By the way, I am not singling out Virbac or Cydectin (moxidectin here). On a different farm at a different time, different anthelmintics would be more or less effective..
Fortunately for the farmer, a particular pharmaco through its area manager offered to run a full drench resistance test on the property. My colleague and I told the owner this would be one of the best things that happened on his place that year, and gave him suggestions on what drenches to test and how to do it. Obviously the pharmaco had expert input as well. The mean worm egg count (WEC) in the untreated Control group pre-drenching was 1460 eggs per gram (epg), with larval differentiation being: Haemonchus (barber’s pole worm) 91%; Trichostrongylus sp (~ black scour worm) 1%, and Teladorsagia sp (small brown stomach worm) 8%. There were too few Trichostrongylus to draw conclusions and barely enough Teladorsagia. Haemonchus of course was there aplenty. 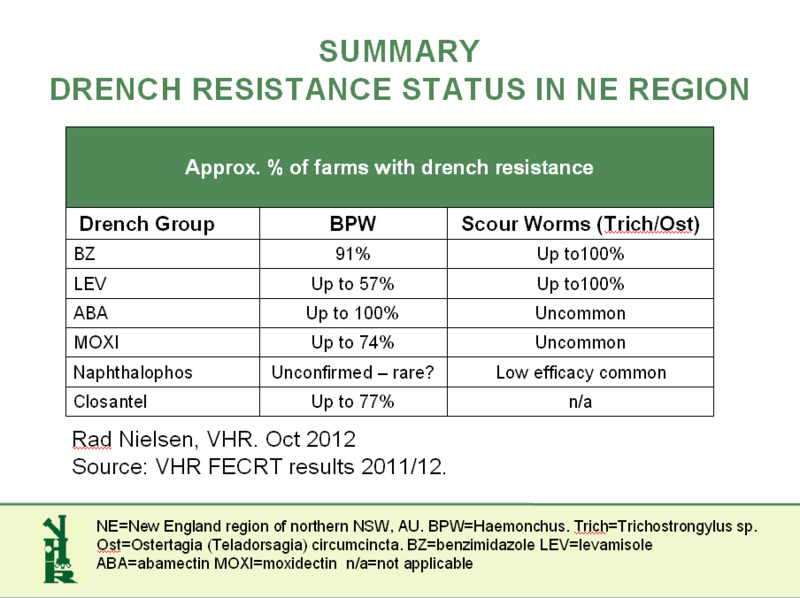 Drench efficacy results (% worm egg count reduction post-treatment) See table, pasted below. The closantel was presumably used at the standard dose rate (7.5 mg/kg in most CLOS products in Australia), which is about 3x the necessary amount to kill resident Haemonchus (unless resistant). CLOS has no claim regarding scour worms, only Haemonchus and Fasciola (liver fluke) (and nasal bot). NAP on its own has high efficacy against adult susceptible Haemonchus, but is generally only 70-90% effective against the scour worms Teladorsagia and Trichostrongylus, and immature Haemonchus (assuming no drug resistance). This sort of result is no longer rare in the New England. Even a best bet can end up being a bad bet. There is no substitute for regular WormTesting and drench resistance testing. * Macrocyclic-lactone(ML)-based ‘triples (ML+BZ+LEV), even those where the ML = MOX (MOX being the most potent of the MLs against the important sheep worms) are not/not likely to be highly effective against Haemonchus, but are still likely to be useful against the scour worms (Trich/Tel). * NAP as a ‘triple’ – NAP+BZ+LEV (‘Rametin Combo’ or the Virbac equivalent (“Combat…”) or NAP+BZ+ABA (ie ‘Napfix’ (Jurox)) is an option. Use NAP in combination rather than on its own. * Monepantel (MPL) (‘Zolvix’) is still likely to be highly effective (despite first reports of resistance (goats) from NZ) and should be used as part of a rotation. eg rotate MPL with NAP-based triples, or with ML-based triples in winter, i.e. when there is no Haemonchus. MPL is the best drench for strategic drenches in this case (being ‘the one most likely to achieve’), e.g. pre-lambing. I agree with this advisor’s suggestions except regarding the use of ML-based triples in winter. Firstly, Haemonchus isoften present in winter, even if only as infective larvae (somewhat tougher/more cold tolerant than Haemonchus eggs). Secondly, the ‘quadruple’ combination, ABA+BZ+LEV+CLOS (“Q-Drench” (Jurox) might be a better option than an ML-based triple, especially if ‘Q-Drench’ is similarly priced to the triples. Obviously there is well-advanced closantel resistance in Haemonchus, but at or around 84% efficacy it still contributes something useful to a combination with respect to efficacy against Haemonchus, and as bonus has useful if not triclabendazole-style efficacy against Fasciola (liver fluke). * The MOX result regarding Teladorsagia is curious, especially compared with that for abamectin. Regular DrenchChecks might help to clarify this. (Remember we are dealing with a biological system, variable egg counts and limited numbers of animals. The efficacy figures here are estimates of efficacy). * Efficacy estimates for individual drench actives are sometimes used to calculate likely efficacies of combinations of these actives. Sometimes this works reasonably well; sometimes it doesn’t, as in this case. (Because were are dealing with estimates of efficacy). For example, the ‘actual’ efficacy for MX+BZ+LEV was 94%, but the calculated efficacy (from the ‘actual’ results for MOX and for BZ+LEV), was 74%. Either way, Haemonchus in this case would be declared as resistant to MOX+BZ+LEV. Having done a DrenchTest, it is a good idea to follow up with periodic DrenchChecks. The cost and effort is small, and far outweighed by the rewards. Obviously the resistance picture varies from property to property, and if some pharmacos are unhappy with these results or comments, they doubtless will find more joy in others. I find stories like this a little sad. I keep thinking, “If only….”. If only the owner (with whom I empathise, by the way) with help from advisors including those selling him products had done basic things a whole lot (months, years?) earlier: notably, regularly WormTesting and regular drench efficacy testing (DrenchTest, DrenchCheckDay10). How different would things be? But I guess that is part of being human: we all ‘stuff up’ in various ways, even when simple and effective solutions are staring us in the face.